Soccer season has officially started in the Crowe house! 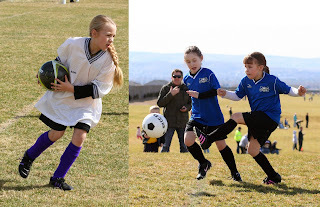 Jayde and Ryann had their first games of the season this morning. They both did really well and though they all have some kinks to work out I think it should be a promising season for both of their teams. Ryann is still playing on the same team she started out with and it's been fun to watch all the girls grow and become great little soccer players! Jayde is playing with alot of the girls she played with last year, but this year she has a new coach...her Dad! Her coach from last year decided not to coach again this year so Doug picked up the reigns so that the team could stay together. They all played really well and though I'm not sure who won, I do know that it was a very close game! I'm looking forward to an exciting soccer season!